First things first. We need to learn how to breathe deeply and smoothly with a practice called “Yogic Breath”. Close your eyes. Feel your body move under your hands. Feel your breath. With no tension, exhale all the air out, then inhale deeply so that your belly expands. Pause then exhale, drawing your navel in towards the spine. We call this a “belly breath”. Let’s do a few rounds of breathing this way. Next, we will add on. After an exhalation, inhale so that the belly expands, then continue to inhale so the ribs expand and sternum rises. 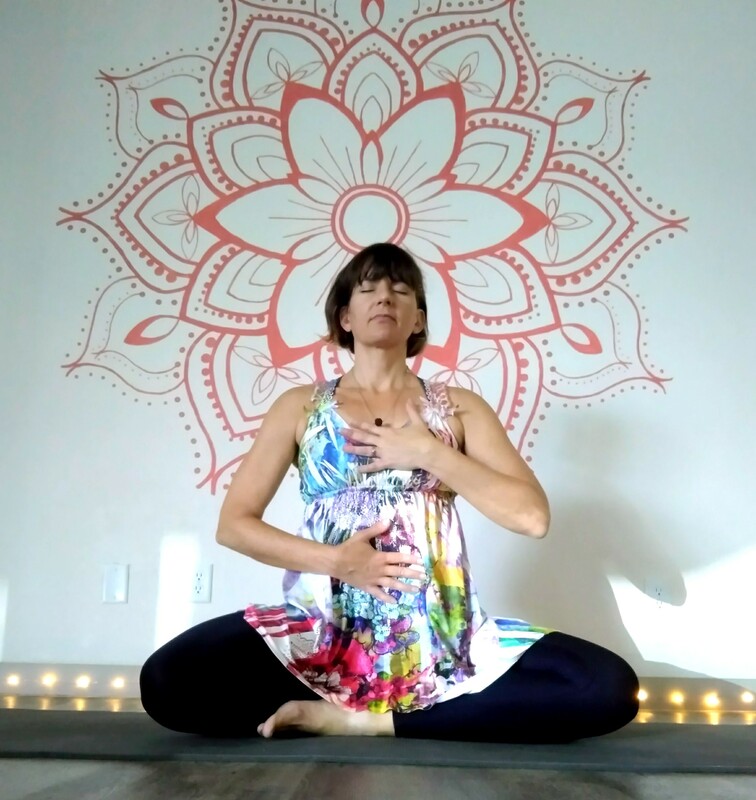 Pause the exhale, letting the chest relax, ribs lower, then draw the navel in towards the spine at the bottom of the breath. This is a “two-part/yogic breath”. Practice a few rounds just like this, with no tension in the jaw, throat, shoulders, or back. The pauses are natural and gentle. The quality of the breath is smooth, like an ocean wave. Rhythmic. Take your time. Once you are comfortable with this way of breathing, we’ll refine the practice. Sitting tall, press your thumb against your right nostril and inhale through the left. The inhalation is smooth, beginning at the belly then expanding through the chest. 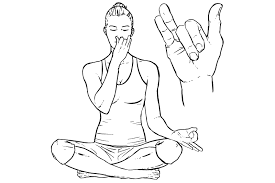 Pause, use your ring finger to block the left nostril and exhale out the right. Let the exhalation be smoothe, relaxed. Draw your navel in at the bottom of the breath. Pause then inhale through your right nostril. The belly expands, then the ribs and sternum. At the top of the breath pause, block the right nostril with your thumb, then exhale out the left… continue for 5-10 more cycles. Take your time. Let the breath be smooth and relaxed.